The Home 15kW Regular Gas Boiler come with many features and benefits that help to make it a highly reliable boiler. Designed and manufactured by Vaillant, this boiler is compact in size with dimensions of 600x375x280mm (HxWxD) so it will easily fit into a cupboard to save that much needed space in your home. 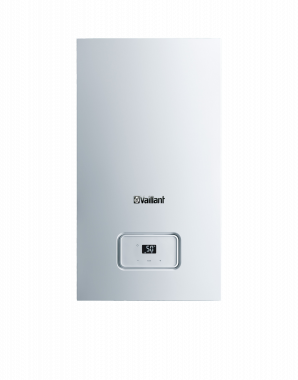 Vaillant’s Home boilers are highly reliable and efficient boilers that’s clear to see from their ErP A rating and 93% efficiency. In addition to this, the unit has a SAP efficiency of 93%. The output of this boiler is 15kW which makes the boiler suitable for smaller homes that don’t have such a high demand for heating and hot water. This range also comes in other outputs of 18kW, 25kW and 30kW, so there’s a boiler to suit the heating demands of almost any home. This highly reliable boiler features a wide range of other benefits such as being fully compatible with all Vaillant controls, fitted with a fully modulating condensate trap for simplicity of commissioning, a fully modulating low NOx burner and a modulation of up to 1:5 giving it increased efficiency. Its SAP performance is 4% higher than any other typical boiler. As well as this, the unit features a wide range of ways to save you money. With a patented 4 side cooling that reduces stress on the aluminium heat exchanger, the boiler to runs more efficiently and lowers the cost of owning this unit. Installation is also made simpler thanks to it having low lift weight and compact size. This is a Regular boiler, also known as a heat only or conventional boiler, which means that it heats your central heating system directly and also produces hot water for your cylinder. As you’ll need a hot water cylinder, which is often fed by a cold water storage cistern located in the attic, Regular boilers aren’t suitable for smaller homes or properties where space is limited. Featuring a 2 year warranty, you can have this unit installed safe in the knowledge that it won’t let you down.